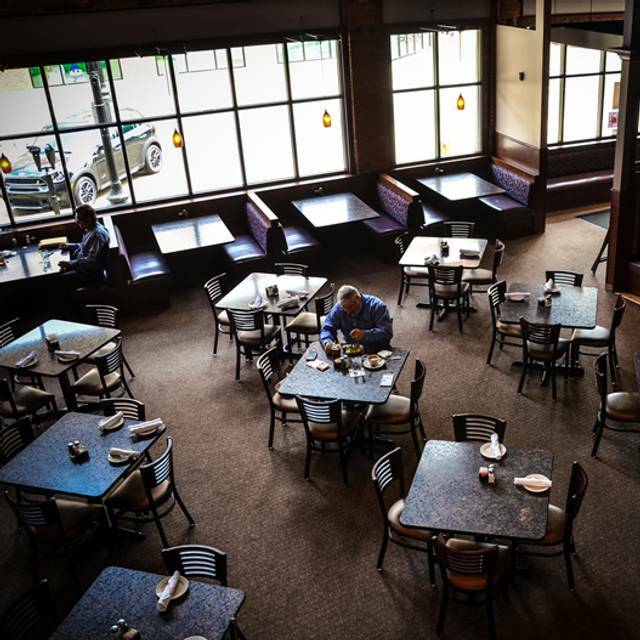 You must make reservations at least 5 minutes in advance of the time at Bath City Bistro. 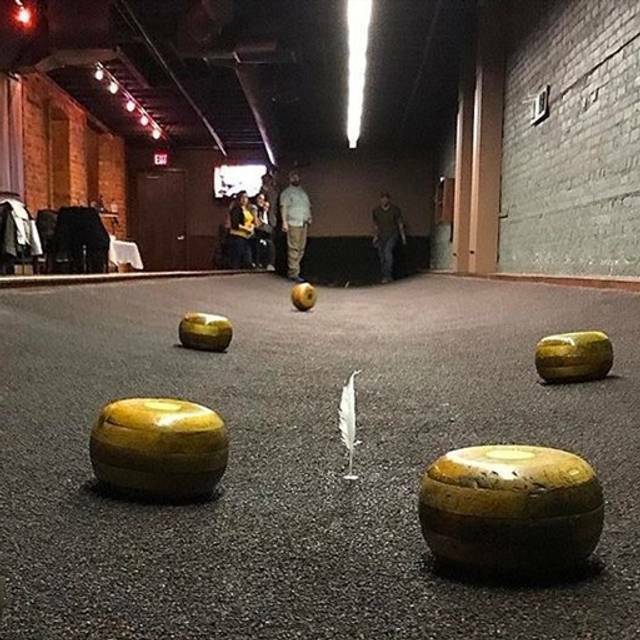 Bath City Bistro provides a unique dining and diversion experience for the Metro Detroit area, centered on the Belgian sport of Feather Bowling. This fun activity is coupled with a menu concentrating on steaks, pizza, the obligatory mussels, and a variety of foods to attract patrons of all palates. And of course, your favorite adult beverages. Bath City Bistro features three lanes of Belgian Feather Bowling, a Belgian sport that could be described as a cross between bocci ball and shuffleboard. 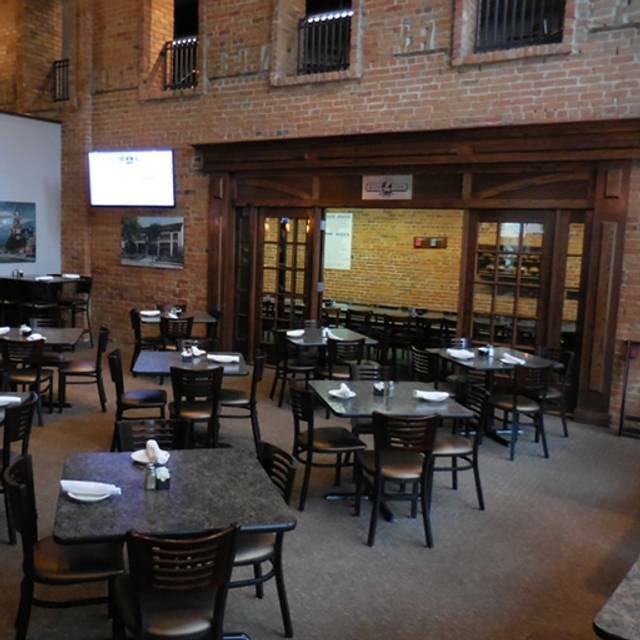 Lunch Served Tuesday – Friday from 11:30 a.m.-4 p.m.
Marinated pork tenderloin, char broiled and served with roasted sweet potatoes, saute of green apples, red onion and walnuts, finished with a bourbon glaze. Grilled chicken, black bean corn salsa, cheddar cheese, diced tomatoes, chopped romaine and honey chipotle aioli in a jalapeno cheddar tortilla wrap. Join us this Easter from 10am-3pm for an All You Can Eat Brunch Buffet for only $10! This was my second time there and it was more wonderful than the first visit . This resturant is a 5 stars to me and its in my neighborhood I've been telling everyone about this great restaurant. I truly would back with more of my family. Thank you for a wonderful time ! The food and service was fantastic. We will be back! Our Party went for the all you can eat perch. The service was wonderful, the food was delicious. We will be returning in the future. The atmosphere was great, waitress was very nice and fast. Calamari was not that great cold and very chewy which is disappointing. But bistro shrimp was great and the mashed potatoes were great. Steak with chimmichurri was okay it was extremely spicy. Green beans were cold and crunchy. The drinks were amazing and overall the meal was good. One of my favourite places in such a nice area. Great food. Great beer selection! Great atmosphere. Staff works together to take care of you! Nice staff. Good service. Great food. Wonderful date night with the hubby. Food is always very good but we had the slowest service. It took forever to get our drinks. It seems when it’s busy on the weekend, we get better service than when it’s slower during the week. However, Matt the manager could not have been more accommodating for our disappointment. We enjoyed 4 different entrees from the menu and our waitress Emily was a superstar!! Thank you Matt & Emily!! We plan on returning soon for a Wednesday perch dinner. We went to BCB with another couple for a birthday dinner. We were seated right away in a nice booth. Our waiter was Robbie and he was excellent- answered all of our questions and guided us with our menu choices. The food was excellent too! We had calamari and Brussels sprouts (yum) as appetizers. Our friends had the fajitas and we had the specials - chicken cordon blue and chicken penne pesto - both were delicious. And the birthday girl received a plate of the most delicious donuts/cream/ice cream/apple combo, complete with candles! It was a wonderful meal and we are already planning on when we can go again. Been here quite a few times. Usually happy with my experience too. But this last visit the service and food were very disappointing. A good variety on the menu. We had an excellent waiter that took the time to answer questions we had about menu items. Recommended some dishes that were very good. Stop in for a drink and some feather bowling. If you haven't tried it, you should. We had an excellent meal at Bath City. The food and drinks were very good and our server was excellent as well. We will be back. Service and the food was solid. As usual, if things are not too busy you can count on a good experience. Had the almond crusted walleye that was on special and that was very good. A stand out item. Thoroughly enjoyed ourselves from the time we entered until we left. Food was great as was the service. Awesome history too. Will definitely go again. We went for Mother’s Day and although they said they were serving brunch, the menu was just breakfast items and one salad. It took about 40 minutes to receive our meals and some of them were cold. The food tasted okay, but nothing special. The servers and staff were all very nice and friendly. I’ve had parties here before and everything was always great, but I will not go back for “brunch”. Great food and service. We eat here frequently. Food presentation was very nice, but didn’t taste quite as good as it looked. My wife and I stopped in and had a wonderful dinner and also ran into my niece and her friends. We will definitely go back. It’s a cool place to meet with family and friends! Top notch! Went for our son’s birthday and I can’t say enough about this place. Incredible food, exceptional wait staff and great atmosphere. Would definitely go again! Our server was delightful and very helpful. As we were first-timers at Bath City Bistro, we asked for her appetizer recommendation. Without hesitation she mentioned the Brussel sprouts. You should have seen the look on my face that that suggestion, but much to my surprise they were great. Same with dinner, which was mussels and clams over angel hair. The location in downtown Mt. Clemens was we lit with ample parking. Worth the drive and will go back soon. 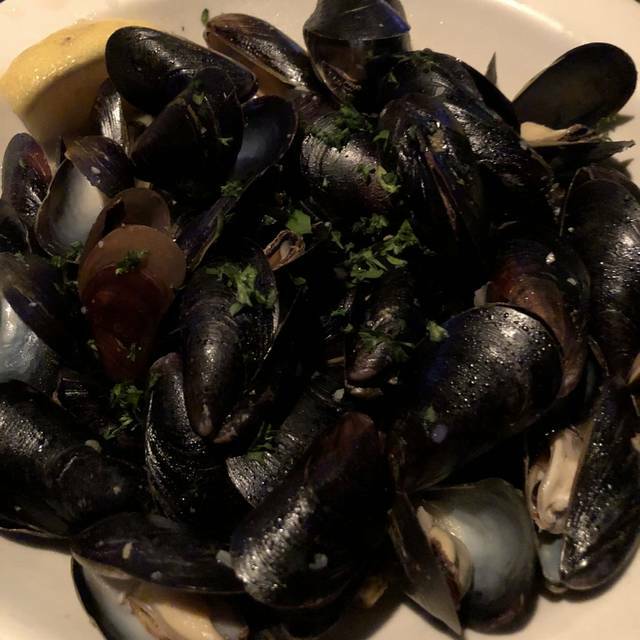 First time with my fiancé for a date night when we couldn’t decide on a place and this popped up in the GPS... Mussels were good, assumed there would be more Belgium fare. The menu has a hodgepodge of everything for everyone. Never been here before but heard good things about it. I loved the atmosphere and food was great! I will most definitely be going back here! Great experience—good food and drinks and we really enjoyed the atmosphere. The feather bowling was great afterwards too! Excellent perch. Homemade fries- not frozen. Owner very hands on and attentive to guests. Definitely want to go back. First time to dine here and it was perfect. Went there mid-afternoon so it was quiet and we sat by the fireplace. Food was great and service went well. Gave us few suggestions what food to order. We ordered the salmon and the Michigan chicken. Food was good, but their home made chips are served cold -- friend and then served cold??? Not very good. Hardly had a waitress come by. Had to ask the gal to clean the water from the table twice, and when she did, she used the napkin from the bread basket. There are two sides to the restaurant. Perhaps if we were seated on the other, busier side, it would have been better.